For several decades, the U.S. foreign policy establishment has spent billions of dollars in Egypt, all in order to keep China out, America in, Iran down, and Israel safe. In fact, since 1979, Egypt has been the second largest recipient of U.S. foreign aid, after Israel. So what makes Egypt so important to the Washington? Any real estate agent could tell you: location. Given that Egypt sits atop the strategic intersection of the Mediterranean, African, and Arab worlds, the control of the nation has always been a remarkably effective way to project power into these three regions and beyond. Egypt is the largest Arab country in the Middle East. The nation also has the responsibility for maintaining the vital oil-shipping lane of the Suez Canal. Last, but certainly not least, Egypt is a signatory to the 1979 Camp David peace treaty with Israel. Make no mistake about it, in Egypt, a U.S.-backed military coup just toppled a democratically-elected government. Lest we forget, Mr. Morsi won Egypt’s election by a larger margin than David Cameron or Barack Obama. President Morsi’s overthrow has placed the army, not the masses, in power. The coup has put power in the hands of a military junta that will protect the interests of the Egyptian bourgeoisie and the geo-political aims of U.S. imperialism. One might ask why it would serve U.S. interests to help the military topple President Morsi, since he is a close ally of the U.S. The answer is simple. Over the years, Washington has become adept at supporting a ruler whilst simultaneously supporting opposition dissent against that same ruler. It is called ‘political leveraging’, or manufacturing dissent. Washington openly funds Egyptian opposition NGOs and civil society through Freedom House and the National Endowment for Democracy. These organizations then become embedded in the protest movement, in order to divert attention from broader issues of Western interference. These opposition groups provide a breeding ground for pro-Western opposition leaders, who may become national leaders in the future. Mr. Morsi is a prime example of a President who formally was a member of an opposition organization, namely the Muslim Brotherhood, who received funding from the U.S. The U.S. has poured more than $70 billion in military and economic aid into Egypt since 1948. Thus the U.S. government’s ability to influence outcomes there has always been significant. CNN reported that Defense Secretary, Chuck Hagel, and top U.S. general, Martin Dempsey, had been in contact with their counterparts in the Egyptian military over the past week. Clearly, Washington not only knew about the July 3rd coup, they authorized it. During both of Egypt’s recent revolutions, the U.S. has acted like the Caliph Harun al-Rashid, who calmly watched the cloud, knowing that he controlled its rain. For fiscal year 2014, President Obama has requested $1.55 billion in aid to Egypt, with $1.3 billion allocated to military aid. The Egyptian military is not only a formidable political institution; it is an extremely rich institution. The military in any given society is a direct reflection of its social class structure. The upper echelons of Egypt’s military are allied with civilian big business who grow rich by building their business empires. The nation’s economy stands at $500 billion and the military is estimated to control one third. Egypt’s top generals also look after the military and business interests of its imperialist masters in the U.S. There are lower ranking officers of middle-class origin, and then there is the mass of the soldiers, who have been conscripted and are composed mainly of peasants and workers. Therefore, the structure of the Egyptian military reflects a society based not only upon internal class antagonisms between the exploited and the exploiters, but also between larger imperialist entities and the oppressed masses of Egypt. Ultimately all revolutions, led by the masses, revolve around bread. 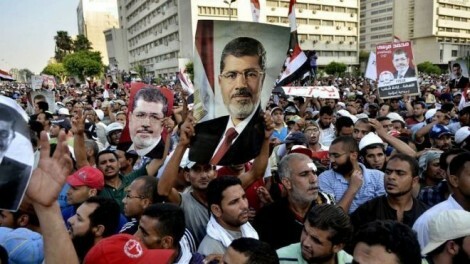 In Egypt, the largest political protests in the history of mankind were no different. Western media continues to characterize the uprising as a conflict between Islamist and secular forces. This could hardly be further from the truth. The uprising is the culmination of frustrations against Egypt’s continued subservience to the United States and IMF policies that continue to decimate the poor and the middle class, in favor of Egypt’s bourgeoisie. In 1991, a devastating IMF program was imposed upon the people of Egypt. The program was enacted to cancel their multi-billion dollar debt to the U.S, in exchange for Egypt’s participation in the Gulf War. The IMF’s austerity measures, widespread privatization, and deregulation of food prices led to a severe drop in the standard of living for most Egyptians. Nevertheless, the Mubarak regime was hailed as a model “IMF pupil”. During his short time in office, President Morsi continued the anti-working class and pro-imperialist policies, which were a continuation of the Mubarak regime. As a result, a combustible combination of unemployment, soaring prices, and a deteriorating economy sealed Mr. Morsi’s fate. A true revolution is not about merely changing the actors on stage; it is about tearing up the script and radically redesigning the plot. The protestors should focus on the real dictatorship in Egypt that makes the actual decisions—the dictatorship based in Washington. Regime change is not revolution. Regime change from Mubarak to Morsi to Mansour serves U.S. interests by ensuring continuity, while providing the illusion that meaningful political change has occurred. True revolution and meaningful political change can only be ensured if the U.S.-backed military aristocracy and its neo-liberal economic policies are thrown out, for good.